This is the story of a famous painting by the American artist John Trumbull, which is used on the jacket of the American edition of our book Gibraltar: The Greatest Siege in British History, published in hardback in the United States and Canada by Viking (ISBN 9780735221628), 449 pages long, plus prelims and prologue, maps and other illustrations. It is also available as an e-book and an audio download. It is almost the same as the UK edition, though with a few corrections and amendments and a very striking jacket. The publication coincides with the 240th anniversary of France becoming officially involved with the American Revolution (War of Independence). Never having recovered from the Seven Years’ War (1756–63), France was looking to ways of seeking revenge against Britain. From 1777 she had allowed arms and other equipment to be shipped to the rebels in America, while American privateers were permitted to shelter in French ports. In March 1778, France signed a treaty recognising American independence, and the first hostile act between Britain and France was a frigate action in June 1778, when the French Belle Poule fought the British Arethusa. The following month, Britain declared war on France. It took France almost another year to persuade Spain to join in, leading to the start of the Great Siege of Gibraltar in June 1779. The UK and American jackets of Gibraltar: The Greatest Siege in British History are very different, but both are based on the work of contemporary American artists. The UK jacket features a painting by John Singleton Copley (see our newsletter 50), while this Viking jacket uses a magnificent painting by John Trumbull. Born at Lebanon, Connecticut, in 1756, Trumbull became a soldier at the beginning of the American Revolution, but turned to painting before it had ended. He is known especially for his depictions of the war, including “The Sortie Made by the Garrison of Gibraltar”. The sortie took place on the night of 26th November 1781, a one-off event during the siege, when British and Hanoverian troops left the garrison to destroy the encroaching Spanish siegeworks. 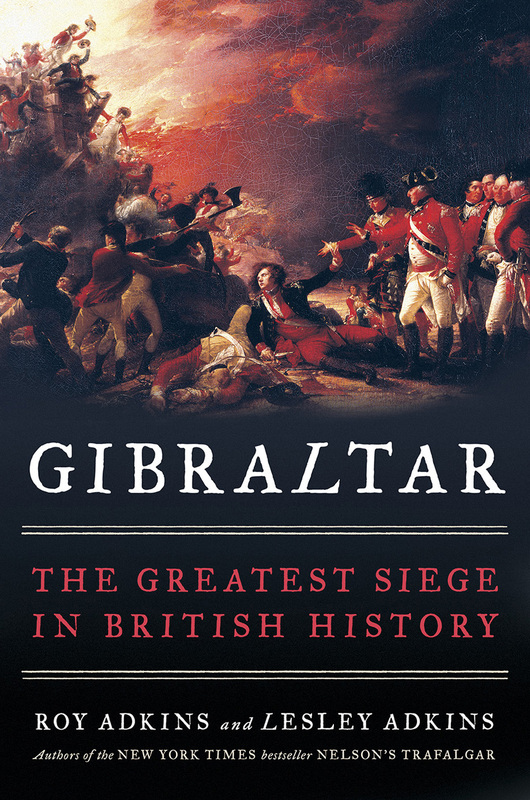 George Augustus Eliott, the Governor of Gibraltar, had learned that they were poorly defended by night, and the few Spanish troops either fled, were killed or were captured. The painting depicts, on the left, the soldiers and seamen destroying the siegeworks. In the centre are a dead soldier and a dying Spanish officer – Captain Barboza of the artillery, who had heroically defended his position and is shown refusing the help offered by Eliott on the right, who is flanked by his own officers. Trumbull was told about the sortie by the artist Antonio Cesare de Poggi, who himself did a superb bird’s eye view (used for the endpapers of our UK edition – see our newsletter 50). Trumbull did five oil paintings of the sortie, the first three of which differ, while the other two are copies. Preliminary sketches also survive. His first version was completed in 1787, but he made an error in the colour of Barboza’s uniform. Until recently it was in the Corcoran Gallery of Art, but is now in the National Gallery of Art in Washington DC, though not on display. The painting on our book jacket is the second version, which was done in 1788. It is on view at the Cincinnati Art Museum, Ohio, and measures 20 by 30 inches. The third version is very similar, though the most obvious change is to its size, being on a monumental scale. It measures 71 x 107 inches and is on view at the Metropolitan Museum of Art in New York. John Trumbull’s depiction of the sortie at Gibraltar is considered to be the finest of all his paintings and obviously well worth a visit. This entry was posted on March 12, 2018 by adkins.